In a story published by Hudson County View confirming MSV's earlier report, City Council members stated there's little interest in voting to approve a Suez water contract presented by Mayor Zimmer. Councilman Ravi Bhalla in a letter yesterday to City Council members informed them he would be recusing himself from any pending vote on the contract. MSV noted earlier the opposition to the Suez water contract presented by the Administration was DOA based on three council members seeking further financial details. Eight of the nine members will decide as Councilman Ravi Bhalla will not be voting after recusing himself from all matters connected to the proposed Suez contract. 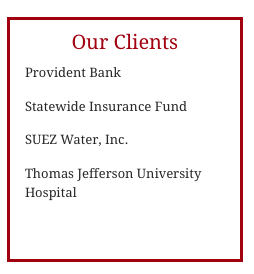 Bhalla is a law partner in Florio, Perucci who lists Suez on their website as a client. will not be voting Wednesday on the City's proposed Suez contract. The above chart is from the law firm website. Council members Ruben Ramos expressed he will not be voting for the Suez water contract and Councilman Dave Mello voiced doubt he would vote to approve it. The Suez contract requires five votes for approval. The only council member who may be open to approving the Suez contract is Councilman Jim Doyle who is running for re-election on the Bhalla ticket. All other council members are backing other mayoral candidates. Both Mike DeFusco and Jen Giattino filed to be on the November ballot leading full council at-large slates. MSV obtained a copy of Councilman Ravi Bhalla's email from non-governmental sources, excerpts of which were published earlier on Hudson County View. The complete email from Councilman Ravi Bhalla to Hoboken council members, the mayor, business administrator and Bhalla council at-large slate mate Emily Jabbour follows. I write to respond to questions raised by Council Members Ramos and DeFusco at the last City Council meeting, about whether potential conflicts of interest may exist in connection with our forthcoming vote to authorize the Mayor to enter into a Memorandum of Understanding (MOU) with Suez United Water at the next Council meeting. I also write to address inquiries and statements set forth in a press release issued by Councilman DeFusco the day following our last Council meeting. • I have zero personal or financial interest in the MOU and the subject matter therein, beyond being a water customer of Suez by virtue of my residency in Hoboken and the fact that water is supplied through this utility, an interest shared by virtually all residents in the City, all Council members and members of the administration residing in the City. • In my legal profession, I am a non-equity partner at the law firm of Florio, Perrucci, Steinhardt & Fader, LLC ("FPSF"). This means that I do share, directly or indirectly, in the profits generated by the firm or firm business. I am essentially an "at-will" employee of the firm. • I am not involved in any way, shape or form in any matters involving United Water Suez at my firm, nor have I ever been involved, directly or indirectly, in any matters involving United Water Suez during the course of my employment at FPSF. • The matters for which FPSF provides services to United Water Suez do not involve the City of Hoboken, nor have they ever involved the City. • I have no personal, professional or financial interest in the subject matter of the MOU, other than the impact it can have upon me as a resident of Hoboken, a common interest shared by virtually all residents of the City, the Council and Administration residing in Hoboken. Notwithstanding the foregoing facts, I have decided to recuse myself from any further involvement in United Water/Suez matters. • As a Council Member, I have never taken part in any negotiations involving the City of Hoboken and United Water/Suez, including but not limited to the MOU that is before the Council shortly. • United Water/Suez has not paid any legal fees to FPSF. United Water/Suez is a government affairs client of the firm and all fees are subject to public disclosure, as referenced in the Councilman's press release. • I have never been present or involved in any way, shape or form in any of the City's negotiations with United Water Suez regarding the MOU or any other matter. • Councilman DeFusco falsely states that there is an ethics complaint "under active review" by the Local Finance Board. This is false, as the matter brought by Peter Belfiore, was rejected on two occasions when reviewed by the courts, most recently by the Appellate Decision. There was no finding of any ethics violation by the Appellate Division in its June 2016 decision, it is not under "active review" in any court or agency, and is a closed matter. In response to other allegations of prospective conflicts of interest with other clients of FPSF, such as New Jersey Transit, please accept this communication to clarify that if elected as Mayor, I will serve in this capacity full-time, and will sever my employment with FPSF before taking office to avoid any alleged or potential conflicts of interests. Any communications by members of the council, campaigns and their vendors, advisors and/or agents that are contrary to the aforementioned disclosures would be false, legally actionable and I expressly reserve all of my rights and remedies against any and all breaching parties thereto. I appreciate your time and interest in this topic. Please do not hesitate to contact me if you have any questions. Talking Ed Note: Councilman Bhalla notes many reasons, mostly unrelated items suggesting where he's not conflicted but doesn't indicate the basis for his recusal from further deliberations on the Suez water contract raised at the prior council meeting. When the issue was raised by Councilman Mike DeFusco, a mayoral candidate rival at the prior council meeting, Bhalla stated he would defer to the Corporation Counsel for a review on his further participation. It's unclear what if any governmental body inside or outside Hoboken offered any ruling or advice on the matter. Councilman Bhalla's letter concludes with vague notions of actionable comment(s) about his recusal involving other council members, campaigns, their vendors and/or agents contrary to his stated opinion in the letter would be "legally actionable." A source familiar with the 2010 ethics complaint insists the case is not ultimately decided but awaits further action by the Local Finance Board. The board is said to lack a quorum to make any final deliberation so the saga is in limbo. Ultimately, the next NJ governor will make the nomination to satisfy the board quorum requirement. An original $100 fine in the 2010 "Condon" matter was at one point dismissed, ruled frivolous before being revived for reconsideration. Now it's extended into 2018, at the earliest.